Chickpeas are probably best known for their starring role in the Middle Eastern dip hummus. 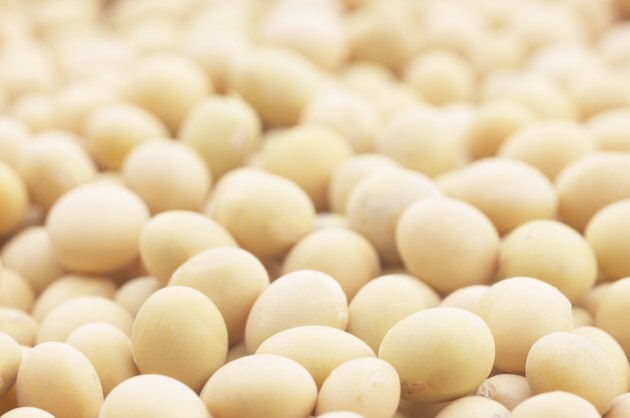 These legumes, also known as garbanzo beans, can be used in a wide variety of ways – including in curries, stews, stir fries, salads and chilies. The beans offer a tremendous amount of nutrients and are a healthy addition to any diet. One cup of cooked chickpeas contains 269 calories and 4 g of fat, none of which is the unhealthy saturated or trans varieties. This cup provides 45 g of carbohydrates, with 12 g of fiber – nearly half of the Institute of Medicine’s daily recommended amount for woman and one-third for men. Fiber helps to lower cholesterol levels and improves digestive health. Chickpeas are a vegetarian source of protein, with 15 g per cooked cup. Chickpeas are a source of 10 different vitamins. Notably, one cup of cooked chickpeas provides 0.2 mg of thiamin and vitamin B6, two of the B vitamins that help you convert food into energy. They also provide 282 micrograms of folate, essential to red blood cell development and the prevention of certain birth defects. Chickpeas also provide vitamin E, vitamin K, vitamin A and vitamin C.
One cup of chickpeas provides multiple essential minerals, including 80 mg of calcium, 79 mg of magnesium and 276 mg of phosphorus – essential to healthy bones. You also obtain 4.7 mg of iron, 2.5 mg of zinc, 0.6 mg of copper and 1.7 mg of manganese by eating a cup of chickpeas. The chickpeas provide 477 mg of potassium, equivalent to the amount in a small banana. Potassium helps you keep fluids and minerals in balance in your body and regulates blood pressure. Purchase chickpeas dried or canned. Dried versions must be soaked and boiled for several hours before consuming, whereas canned chickpeas are ready to eat. Although convenient, canned chickpeas contain significant amounts of sodium – over 700 mg per cup. The Institute of Medicine recommends consuming less than 2,300 mg of sodium daily. The canning and storing process also reduces some of the nutrition of the beans. Canned chickpeas are slightly lower in protein, fiber, iron and folate.